Who doesn’t remember flipping through pop-up book Where’s Spot? by Eric Hill or giggling with glee over Roger Hargreaves’ Mr. Men and Little Miss series; Little Miss Sunshine in particular? 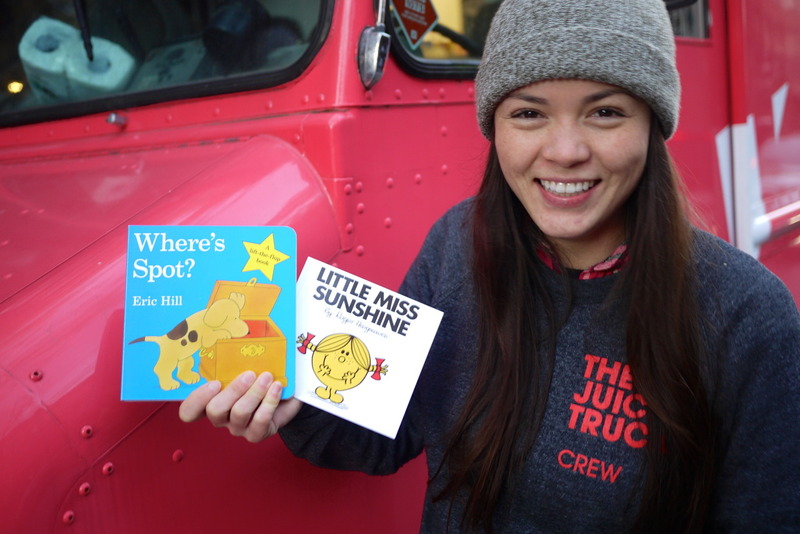 Little Miss Lauren Ho, part of the crew of community supporters at The Juice Truck, donated these most memorable books from her childhood. “I think I just liked the girl, you know? You want to be the person in the book,” she said of Hargreave’s sunshine story, “She’s cute, she has pigtails, she has freckles. I have freckles!” Delightful. Hear more from Lauren below. A Good Book Drive is an annual book drive to bring stories to a new generation of readers, and support kids in need of new books. Running through the month of November, A Good Book Drive will be inspiring Vancouverites to purchase a new copy of their favorite kids’ book and deliver it to set locations throughout the city. At these drop off locations you can personalize your donation with a special bookplate, sharing the story of why that book is special to you. All books will be donated to this year’s book drive recipient, Frontier College Waiting Room Literacy Pilot Project. Share your favourite stories with A Good Book Drive on Twitter, Facebook and Instagram.